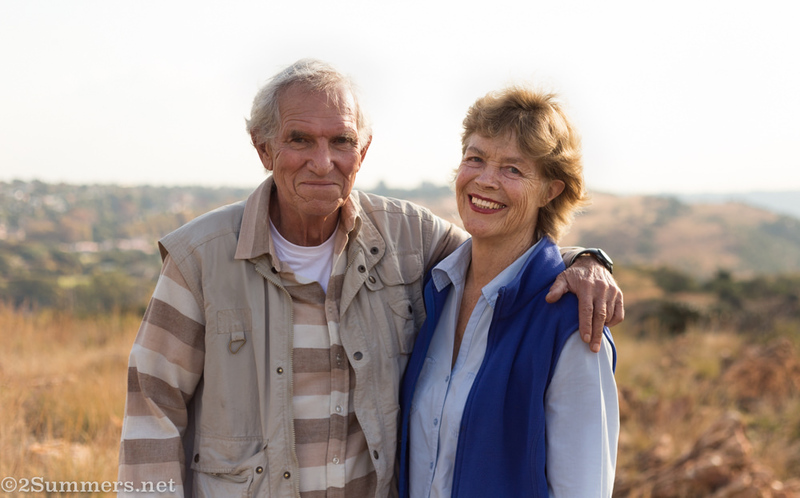 Last week Wendy Carstens, the chairperson of the Friends of the Melville Koppies, asked me to take a portrait of her and her husband, David, at the top of the Koppies. The portrait is a gift for their daughter’s birthday. I have huge respect for Wendy and the work she does maintaining and promoting the Melville Koppies Nature Reserve, with a small amount of money and a massive amount of determination. So I was honored when she asked me to take the portrait, but also nervous. I don’t do many assignments like this and I was scared of messing it up — that Wendy and David wouldn’t like any of the pictures I took and I would feel like a miserable failure. 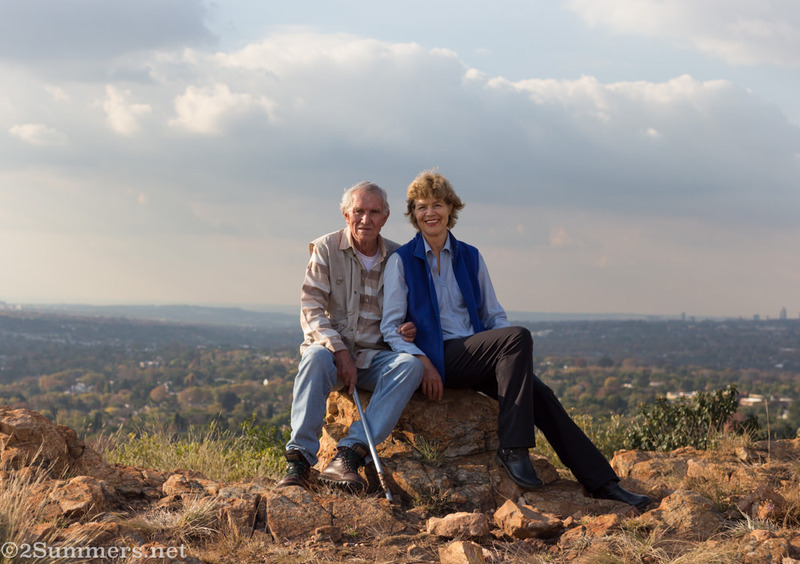 Wendy and David at the top of Melville Koppies Central, with the northern suburbs and Sandton City behind them. This is the picture they chose. Another option, with Melville in the background. Wendy liked this one too. This one was my favorite but I don’t think they wanted such a close-up shot. Anyway, this is a super-short post. But I thought I’d show off some pictures I’m proud of and remind you that the Melville Koppies is (are? Subject-verb agreement stumps me here) the best park in Joburg and everyone should visit. 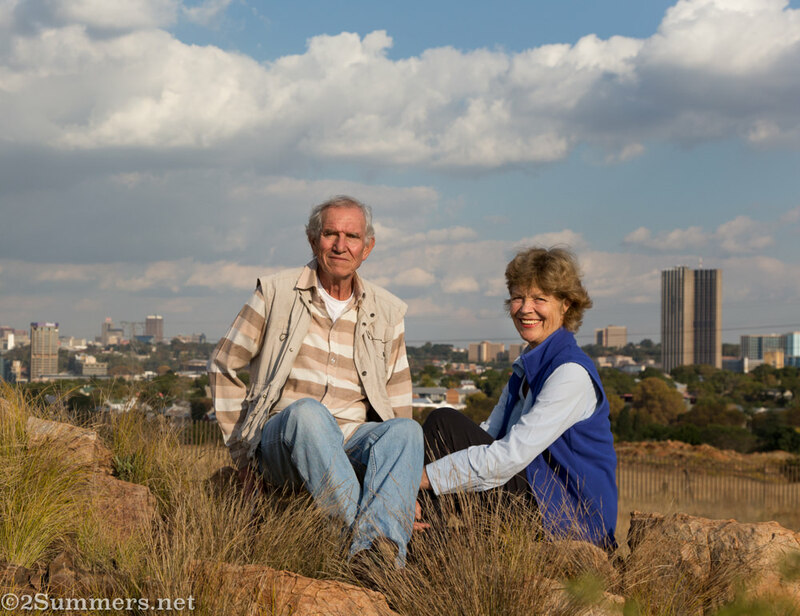 The Friends of the Melville Koppies host great guided walks every weekend. Read more about the history of the Koppies and Wendy’s work here. Wonderful job. I can see why they chose the one they did — the close-up blurred out the Koppies, which I gather was part of the point. The other one had a tall building in back which was a distraction from these two wonderful subjects. Kudos! Yep, you’re quite right. Hope all is well with you! Your fave pic is also my fave! I like the middle pic with the skyline. It also had kind of a candid feel. I like that one too, but the power line annoys me and my photoshop skills still aren’t good enough to erase it. Thanks so much for the blog and photos, Heather. It was quite a giggle having two wrinklies trying to act like lovebirds on the beloved Koppies, but you caught the mood and the Koppies beautifully. My daughter who now lives n Oz loves the photo.